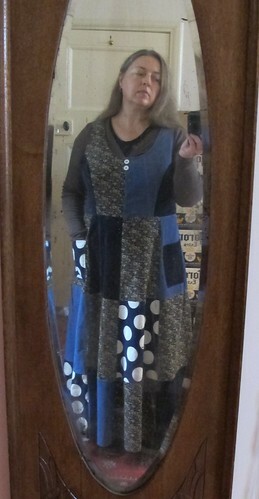 I’m not sure if I’ve made the nice fun winter dress I was aiming for, or a dumb Holly Hobbie clown frock. Both I think. My opinion as to which will depend on mood. Today I like it. I had inadvertently collected five different kinds of blue pinwale cord, none big enough for much of a garment. 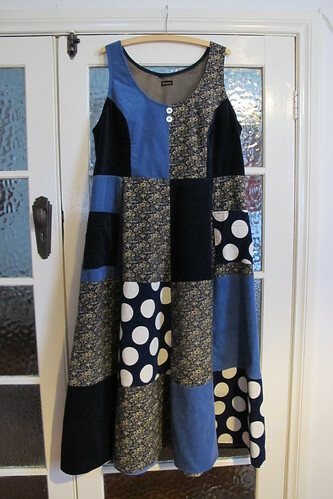 I also wanted another long winter dress and I love making patchwork. 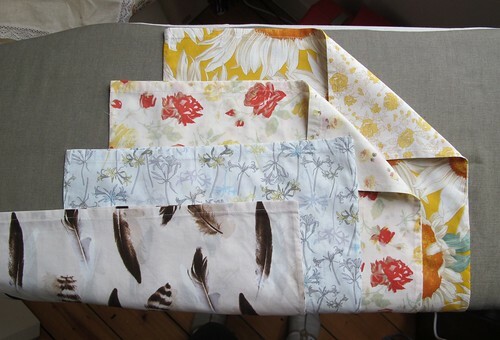 I only used four of the fabrics in the end. The palest blue stood out too much, and wasn’t needed for acreage. 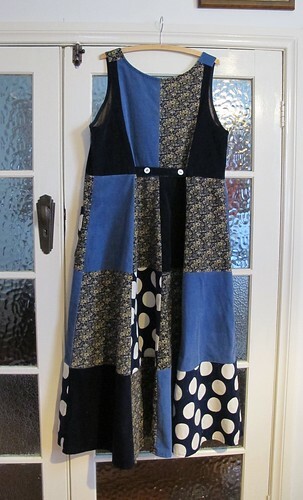 The polkadot piece was a mere scrap given to me for free at a stash market when I expressed interest in it. 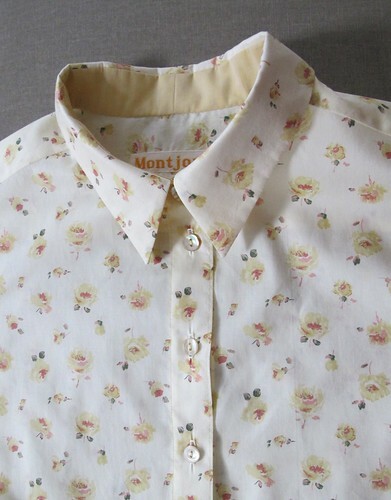 The floral print was a strange bolt end that had been cut into from a fashion house clearance shop. Anyway. I think it came together quite well. The bodice is a cut down version of the gold waistcoat I made last year. 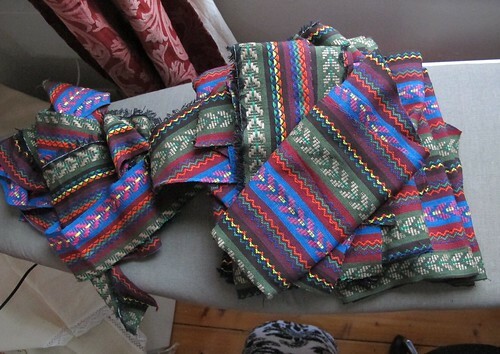 It is just big enough to slip over the head, helped by the lining. 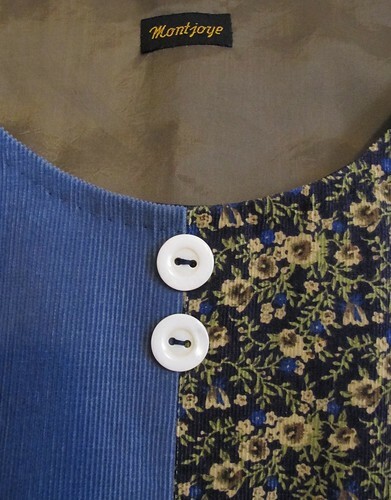 Then there is a back belt that buttons to improve the shape. That can be buttoned loose if one prefers. All the seams line up nicely except the side front. That should have had more thought in the cutting stage. Obligatory button shot. These are just decorative. Usually that’s against my rules, but they seemed to be needed for visual balance with the big white polkadots. Here is on. 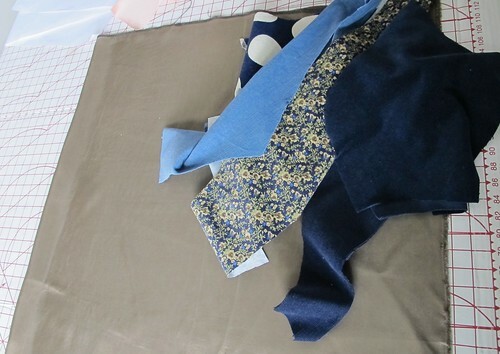 Glad I remembered pockets this time, which used the last bit of the polkadot fabric. Not impressive sewing, but a nice bit of thrifty remodelling. Making use of quality fabric and keeping some memories. I had a bunch of too small and/or worn out garments made from liberty lawn and other fabrics that I loved to much to part with. I’ve made the largest pieces from six of them into four simple bags. These will I think mostly serve as shoe bags for travel. They are near weightless. Here is one of the shirts when it was newly made. I love the fabric so much. 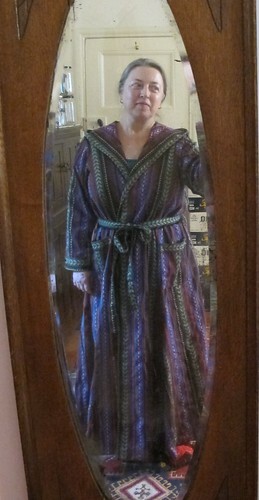 I could have hung on to it in hope of weightloss, but it turns out the neckline wasn’t ideal anyway. So even if it fit again, I’d rather make new shirts. Bags of prettiness, thrift, practicality and memory. Hmm, I might see if the rest of the garments might yield big enough pieces to try making waxed fabric cloths for food storage. Mexican inspired cloth has been in the shops the last few years. I had been interested to get some but was sad that all the garment quality bolts I’d found were poly cotton blends. Then I found this, advertised on the store website as 100% cotton. On special even. Woo hoo I though, I’ll have me some of that. Going in believing it was cotton, I didn’t assess it in person carefully enough. It turns out to be pure plastic. Boo hoo! I’ve made it up anyway into the hooded robe I wanted in the first place. We will see how it wears, and whether I can stand it, natural fibre fan that I am.